Him and Sean Connery are the best father/son combo in a movie ever! I'm only 23 but my heart still goes pitter patter for both of them! He lost it at least five years ago. You sure that's not a picture from Witness II? 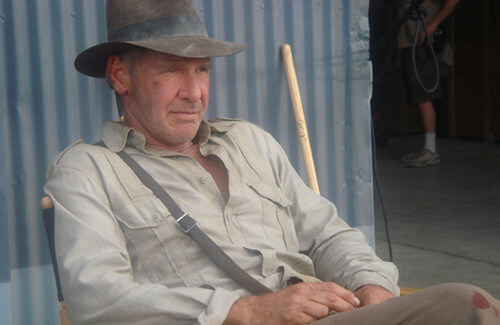 Love Indiana Jones! Who can resist a smart, rugged guy! Right now my fave Hollywood guy is Orlando Bloom. He was pretty cute in Pirates. HF is dead to me. Me no likey calista. My dad saw this picture last night, after I posted my other comment and said that was the hanger in Deming, behind Ford, that was repainted specifically for the movie. I can't tell you ladies how many times we were out there, growing up, watching my dad mess with his plane. He said that Spielberg flies in every day and his jet is like $20000/hour to operate. He also said that he thought Ford was staying in Deming in one of the hotels for the duration of the shoot. So when you ladies see the movie, parts of it were shot in my hometown..how very cool! Yay! Harrison is my absolute favorite. I named my parrot Indy after this character. Can't wait to see it!! !